It's not often we come across a clean E34 M5 - these were the last of a breed, with a strong high-revving handbuilt 6-cylinder engine, classic late '80s / early '90s clean Euro styling, and the quintessential BMW proportions introduced back on the Neue Klasse cars in 1962. The E34 is much more modern and complex, but still reminds us of the good old E3/Bavaria and E28 sedans - and that's a good thing. 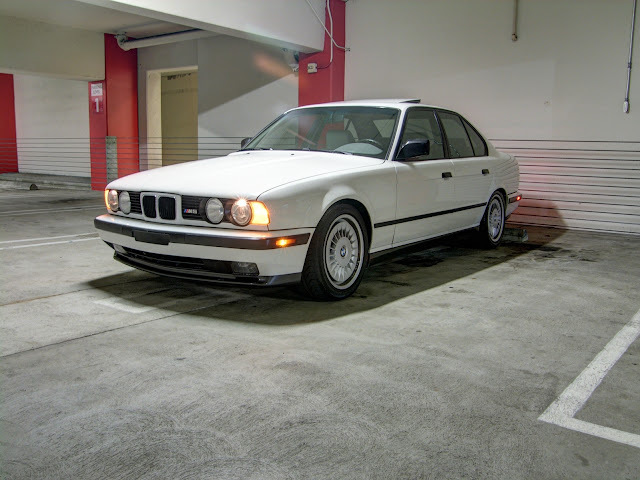 This sanitary Alpinaweiß (Alpine white) example looks to be well loved and well maintained over the years, and would be a great alternative to an E90 3-series at less than half the price. Find it here on craigslist for $14500 or best offer in Orange County, CA. 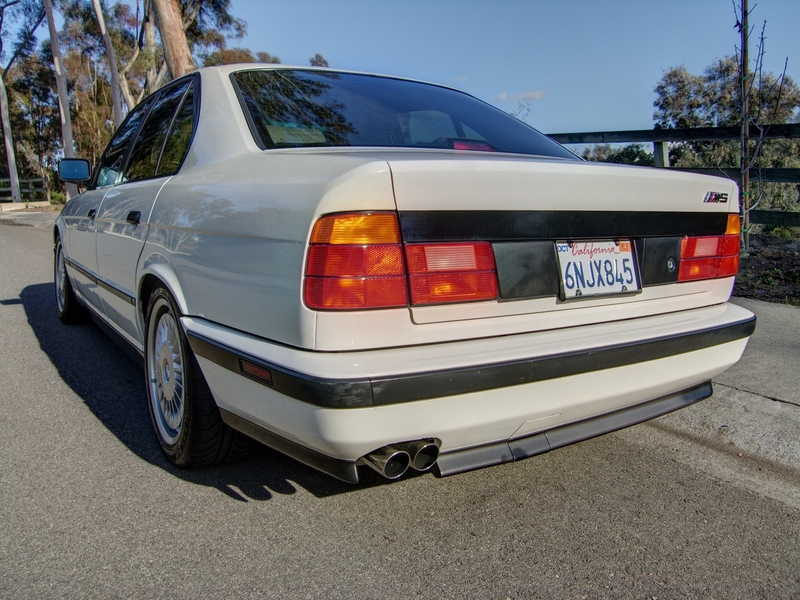 The E34 M5 doesn't quite earn our "Fast" badge, at 6.4 seconds from 0-60 mph. But for a production-based sports sedan designed in the 1980s, it was seriously quick for its time. Performance compared to one of today's 500 - 600 hp bruisers is likely to be more direct and lively on flowing mountain roads, with less emphasis put on brute straight-line acceleration - which is fine by us and makes for a much more enjoyable and entertaining daily driver. 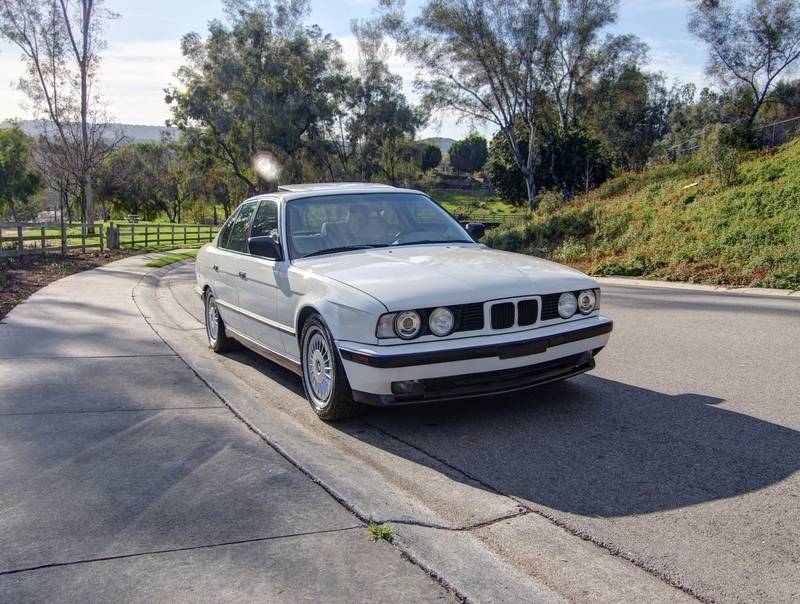 The E34 M5 was entirely hand built and may look ordinary but is a pretty special and rare vehicle, although other car dorks like our friend DWood are the only ones likely to be impressed by it these days. This one wears its original M-System turbine wheels with bolt-on brake cooling wheel covers - which would get tossed by your average gold chain wearing donk enthusiast, so the fact that they remain is a good indicator that this one has been kept close to OE spec. This car looks sharp in white with black trim, including the black stripe on the trunk lid that spans the gap between the turn signals. We're not sure if this was an option originally, or a custom piece added at some point in its life. But it necessitated removal of the BMW roundel badge and gives the rear view a distinct aspect. We've never seen an E34 with this treatment but different isn't always bad! The hand-built S38B36 inline six is a 3.6 liter sweetheart that originally pumped out 307 hp in North American spec, breathing fire through its individual throttle bodies and its set of factory installed stainless steel exhaust headers. This particular car has been bestowed with an ECU re-tune chip from Dinan, so expect 342 hp @ 6800 rpm, and 294 lb-ft of torque @ 4000 rpm according to Dinan's website. With recalibrated spark and fuel maps the car should run safely on California's piss water 91 octane ethanol-infused "gasoline," and has a higher rev limit to boot. The suspension, shifter, and brakes have been upgraded as well, and it seems the owner has kept up on maintenance and detailing (judging by the spotless engine compartment). The snowtrooper-themed white and gray interior may not be to everyone's taste, but at least it appears to be as immaculately clean as the exterior and engine bay does. 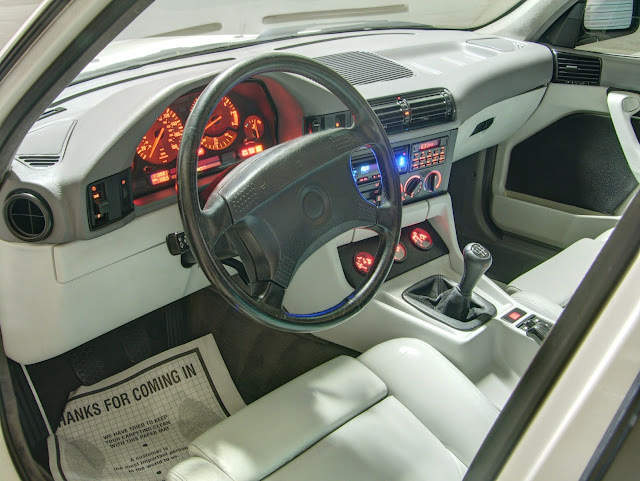 The classic red BMW dash backlighting looks sinister against the light colors, and we'd consider this interior not because we're big Don Johnson fans but rather because it would stay much cooler to the touch than equivalent black leather after sitting in the sun. The paper dealer floor mat has us scratching our collective noggin about the details of the sale - is this being offered by a private owner or a flipping dealer? Perhaps the above photo was taken just after detailing, which would explain the presence of said paper mat. Either way, if we were in the market for a unique manually shifted Euro sports sedan, we'd give this one a proper test drive and a closer look. Looks to be a great car, make sure you get all maint records from the owner. Although many malign the S38 for high costs, if it has been well maintained, and driven regularly, don't expect outrageous costs (HINT:-learn how to adjust your valves yourself). One item, I would expect that the delaminating door cards (dark grey in the pic) should have been fixed at this price, but it is a small issue. 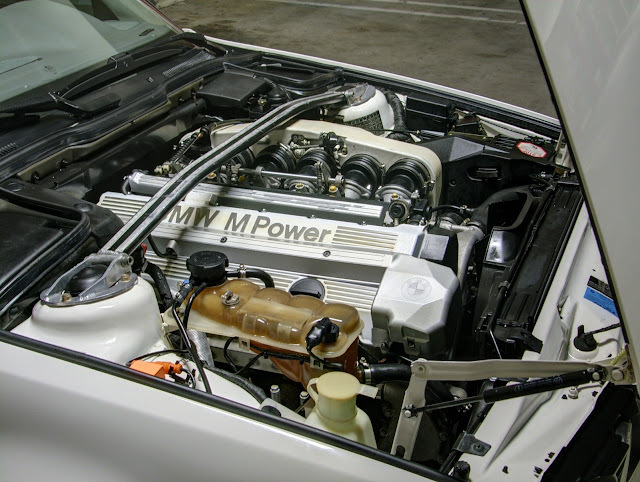 This M5 has some tasteful modifications, the engine bay is extremely clean; get a PPI by a BMW mechanic and if all shows good, enjoy it, and you listen to the song of the engine.